Hi friends you would have seen a reply button to each particular comment in wordpress blogs, and we also want blogger to add this feature in blogger comments and make blogger comments more useful.But they busy in adding more blogger features to blogger blogs to make it more easy and useful.As its not possible to make hack to have this reply button in blogger comments as wordpress blogs, but we have come with small hack like this to make reply button which would make look blogger comment system look better than before. Other hacks to improve blogger comment system are highlight blog author comments and numbering blogger comments which can be quite useful for you to make blogger comment system more useful and beautiful. Now lets continue to how adding reply button to each comment in blogger. As you would have seen this reply button in picture above, which will make you more clear, or check the below live demo to check its working. Let now continue to tutorial how to add this to blogger comment system. Step 1 : Go To dashboard Click Design > Edit Html > Tick the ‘Expand Widget templates’ box. And place the below codes after it. 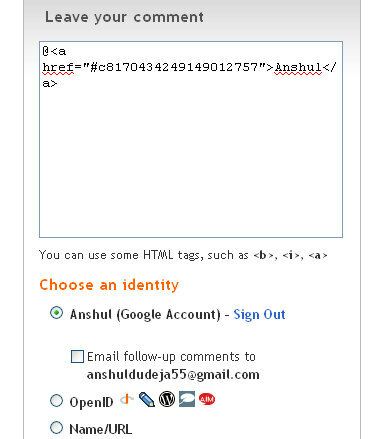 You must need to change the YOUR-BLOG-ID with your blog id.Now how to get your blog id.Just got to blogger Design > Page Elements. Now see for adress bar in your browser.You will get link like this. Just get the id number in pink border and replace in the above code.And you have done now and just save your template.Now you will be able to see the reply button in each blogger comments. Now Some customization to reply button. Some users will like to want to keep reply button instead of text [reply].So just replace [Reply] in red in above codes with below image link and you will get reply image instead of that text. Just to have your own image change the image link with yours to have your own image. As now your readers just need to hit the reply button to any particular comment and a pop window will open like below and just need to write comment there and publish it.As it will make comments publish fast and easily. Just type your comment after the text written in window above and publish it. But still i feel many will like this for sure to make look here blogger comment system look good and making easy for readers o reply. If you have any further questions leave your comment below i will try to solve your issues. thanks for the info! you have a great blog here! what u saying man ??????? @ sev ya its my template only i think thre is no phrase in it i told u to find. you can find above word in place of one in tutorial. i tried it but still can't find it.. i browse it for almost 2 hrs.. and also the comment settings is right also, i dont know whats the prob..
@rhaye see if so hungry for this hack invite me to your blog on my id anshulaffprg[at]gmail.com i will find and do.Hope u woud be knwoing how to add me an author and grat admin for some time to make chnages in your blog. @rhaye this is it have t do it very carefully. i cant find the "data:commentPostedByMsg" phrase— should i search fore something else? @dinu chk u have expanded your codes. said is for that phrase if u dont have it try find direct said or says will help u.
Blogger doesn't allows to change the order of comments. The reply button will be helpful for administrators especially. Thank you sharing this great tutorial. It really is a great help. However, after I have added the codes and tested it, the pop up comment window does not have the "Name/URL" option. Can you please advise why is this so? Is it possible to use "Embedded" instead of "Popup", so it will directly go to the comment box below? really nice post i have added in my blog…. This did not work for me – I'd love to do it and it seems most can get it to work…I'll keep playing with it.